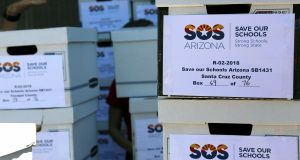 Arizona’s public schools need help. Even as we agree with the truthfulness of that statement, a solution isn’t obvious. But, we as leaders within rural Arizona’s political and education communities want to help our colleagues focus on the heart of the problem the way we do. Then we can work toward meaningful solutions. Gov. Doug Ducey said Monday that teachers who blame him for the downfall of the Invest in Education Act need schooling on how government works.